New game genres are a thing of beauty, in as much as you can expect a fresh concept, regardless of the actual quality of the game. But perhaps in a pursuit of pure originality, one might forget the charm and time-honed fun of a traditional platformer. Mario, Sonic; heck, even Nathan Drake, all find at least some of their hold in history due to their platforming mechanics. So will this newcomer from Crescent Moon Games earn a place in the platforming hall of fame? Or will it drown in a sea of better predecessors? 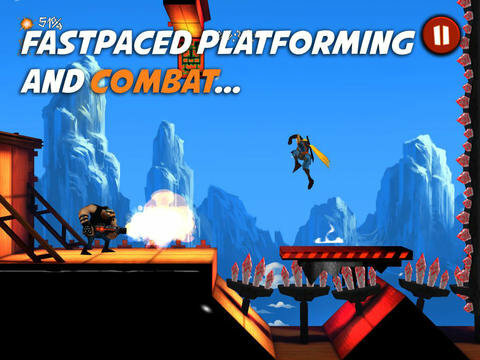 “Mobile platformer” tidily sums up Shadow Blade. 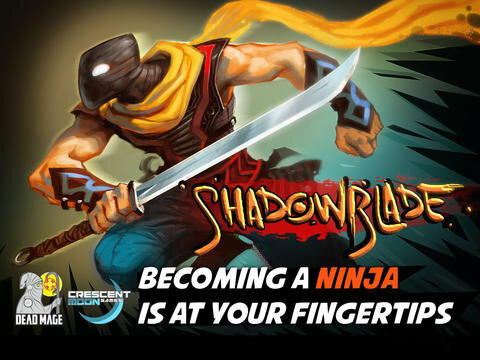 Imagine League of Evil, or Super Meat Boy; replace their respective protagonists with a ninja, and you won’t have a bad image in your head of how Shadow Blade plays. In fact, you just might have a complete idea of how Shadow Blade plays, which is an early knock against the game. The game consists of a series of microlevels, much like any other twitch platformer. Each stage pretty much keeps the same objective (reach the end with your head still on your shoulders), save for a few stages where you simply try to kill all of your enemies as fast as possible, but those stages are the only exception to the overall tone of the game. Throughout most of Shadow Blade, you’re trying to run as fast as you can through a stage; dodging enemies, avoiding obstacles, and maybe snagging some collectables. The ground is well trodden, but the game still manages to hold the player’s interest due to its presentation. Developer Dead Mage plugs the ninja theme into not only the levels and sound, but also into the platforming itself. Instead of being forced to avoid enemies, you can slash away with your katana (although this is not without risk, as enemies can kill you in one hit), and a superb series of animations makes the wall-climbing, stealth-stabbing, and flat-out running look satisfyingly fluid. Obviously not perfect, a single play-through will reveal the game’s flaws. The length, for one, is in dire need of an extension (that’s what she said). Almost the entirety of Shadow Blade’s content can be played through in a single, one hour session, and that alone will leave almost all players wanting. But perhaps more glaring is the game’s fundamental flaw; it’s teetering on the edge of too blasé. It’s fun, yes, but it doesn’t give gamers the chance to experience anything new. And yes, I know I said that new isn’t always good, but falling back onto an old formula without tweaking it at least a little isn’t good either. You need to sprinkle some salt on even the best of dishes every once in a while, and although the game looks great, it could have used some more seasoning. It is pretty, polished, and fun. But it’s also short, and too unoriginal. Compare compare Shadow Blade’s good with its bad and see if you would still want to play it. Those looking for an iOS platformer to pass the time are most likely to enjoy it, but even they will fail to find any lasting satisfaction in Shadow Blade.